It may not come as a surprise to many, but the recent growth in mobile web browsing has increased at such a rate that it has taken many by surprise. One leading mobile web browser company, Opera, announced that there was huge growth in people using their mobile to access the web over the past year. In fact, Opera stated in their report that the increase was as much as 84.7% compared to the same period last year. Opera Mini is just one browser used by owners of Smart phones so it doesn’t give a full picture as to the extent of mobile usage for web browsing, however, it does give a good indication of the trends of mobile users. Another interesting statistic from Opera’s report was that in December of this year, 7.4% of all US users of Opera accessed the Amazon.com website on their mobile phone. This is clearly only a small indication of the change in user behaviour when it comes to browsing the Internet. Other web giant, eBay, announced that their mobile sales trebled to $2bn in 2010. Marks and Spencer also announced that visits to their website by mobile device users hit 1 million+ uniques per day in December. Back in October they announced that their mobile phone orders had hit 13,000 in just four months. There is clearly an opportunity here for business to make sales or promote their business through mobile devices, but the problem is that most websites are not built to work with mobile phones. In fairness to most mobile phones, they have decent web browsers that make navigating even the most non mobile friendly website easy enough to navigate, but is this really good enough? Shouldn’t it be easy for your potential customers to navigate your website at ease on their mobile device? To help Irish businesses get a good mobile presence with their website, we’ve decided to do a special offer on the creation of Mobile Friendly Websites for a limited period only. For just €299+VAT we will create a mobile optimised version of your website (max 10 pages). Mobile Website Design – Is it time to offer a mobile version of your website? I guess it’s not really surprising that mobile web browsing is continuing to grow at lightening fast pace. The sheer amount of people who carry a web enabled portable device has grown significantly over the past couple of years. A lot this growth is of course due to the massive success of the iPhone. Like, it wouldn’t be strange if your granny had an iPhone nowadays, yet she probably didn’t have an Internet connection before she owned one! Of course, browsing the web through a mobile device is by no means a new phenomenon, it’s something that has been available for quite some time. In reality though, most people didn’t bother using the web on their phone to access the Internet and with good reason. One obvious reason, was that it could be quite expensive to access the web on your mobile phone. And secondly, viewing websites on a mobile could be at best, extremely annoying. Websites simply weren’t built to cater for mobile devices. Even today, most businesses don’t bother providing a mobile alternative of their website. In fairness, most mobile phone web browsers are pretty good at allowing you to view full websites quite easily. However, they are not perfect. Most of the larger and more popular websites such as Facebook, Twitter, CNN and Google automatically offer you a slimmed down, mobile version of their website when you visit from a mobile device. Navigating around a pupose built website is always a lot more fun than having difficulty choosing and clicking on links of interest, even with a decent mobile phone browser. Recently, on one of my own websites I was shocked to notice that over 10% of the traffic to the website (over 1,200 unique visitors) on one given day was from mobile devices. You might say I missed the boat a little, but for me this was a clear indication that the growth in the use of the web from a mobile device now warrants a mobile friendly website. Look, I’ve been there in the WAP days. I’ve built WAP websites… what a disaster. There were a lot of issues with WAP, but I just don’t see those issues arising with the current state of play. As long as pricing for data packages from the mobile phone providers continue to decrease and people buy web enable devices, it just seems to be the way people will start viewing the web. 73 Million iPhones have been sold since they were launched and I think it’s safe to assume that a lot of those that own one, have also used the App Store to buy an app or two. A process that is very straight forward – in fact probably more straight forward than any website you’ve ever visited. Would you have envisaged many people buying items with their phone, through the web 5 years ago? Probably, but you probably thought it would take more than 5 years to get there! For me, there has never been a better time to get your website mobile. Things are only going to get better. Already the sale of Android enable phones is out stripping the growth seen by the iPhone. It’s clear to me that the mobile web has arrived and is in full swing! A friend of mine recently upgraded his Blackberry to an iPhone and was extremely frustrated at trying to get his email to work on it. Not one for missing out on an opportunity, I jokingly said, I’ll set it up for you and you can give me your Blackberry. Surprisingly he said “that’s no problem at all, I was going to throw it out”. Happy days…. I’ve always steered well clear of the whole Blackberry “always on” scenario. I didn’t like the idea of having email on my phone and being interrupted at dinner with work email that I’d just have to deal with. Being able to leave the office and shut off completely has always been the way I like to work. But I have to admit, I was always interested in a device such as this that allowed me to collect email on demand only. After becoming the proud new owner of a Blackberry Curve 8900, I was well and truly looking forward to having a good play around with this device. Unfortunately for me, I am with Meteor and they don’t have a Blackberry Data Plan. This means that a lot of the excellent Blackberry features are unavailable. Things like push email (which I didn’t really want anyway), Blackberry Maps, MMS and even their native web browser just wouldn’t function. Unfortunately it’s not just as simple as entering a number of different APNs, in fact you can only add one APN on the whole device. Not happy with being defeated by a little electronic device, I set out to find out how I could crack this little beauty and get it to do all the things I need it to! The easiest things to get up and running were email and browser. The email isn’t push, but a manual on demand collection (which is perfect for me). If you use GMail you can get simulated push email. The first thing to do is set up your Meteor data APN on the Blackberry. You do this by going to Options > Advanced Options > TCP/IP. In here you should check the box beside “APN Settings Enabled”, enter data.mymeteor.ie for the APN. The username should be is “my” and the password is “wap”. Click the Blackberry button and choose save. Check your browser now, if you can surf the web – get over to www.opera.com and download opera mini. If not, try get access to a Wifi network and connect your device to it. You should be able to browse the web now with your Blackberry. Once you’ve installed Opera Mini, you should be able to surf the web with or without WiFi. My next step was to download and install LogicMail (www.logicprobe.org/proj/logicmail) – this took me a while to figure out and get it up and running. Basically, you need to set up the SMTP server first. I even had problems with this and in the end needed to use Gmails free SMTP server to send mails. I also tried out the Gmail for Mobile app, which is brilliant. If you use Gmail, I recommend that you install this. The only problem for me was, I don’t use Gmail that much. The Gmail for Mobile app can be left running the background and appear as if you are receiving push email. Basically you need to update the service books that are on the Blackberry. 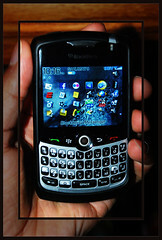 You do this by using a combination of the Blackberry, a USB cable and the Blackberry Desktop Manager. On the forum above, you will find links to IPD files which are the Service Book files. I played around and whittled down which ones I actually needed. To date, I still can’t figure out how to set up MMS messaging – so if anyone knows how… please leave a comment! I’ve been reading all the dreaded reports that the new Internet Explorer 8 seems to be causing havoc on some people’s machines. But I have to say, I’ve been using it for most of the day and haven’t had an issue yet.